In the UK, almost every second adult identifies as having had a mental health condition at one point in their life. And there is a strong link between mental health and poverty. In Scotland, the health burden of mental health and substance abuse disorders is more than four times higher in the most deprived areas than in the least deprived areas. Someone’s mental health affects almost every aspect of their life, including their physical health, close relationships, housing and their employment situation. It is the link between mental health and un/employment that I want to focus on in a series of three blog posts. Unemployment often leads to social isolation and low self-esteem. Combining this with the stress and anxiety that come with an insecure income or rising debt, makes unemployment a key risk factor for mental health problems. Across almost all of the employability programmes we work with, more and more participants are presenting with mental health problems. So, what does the high prevalence of mental health problems among employability clients mean for providers and their staff? How are they adapting their services? What can employability and health service providers learn from one another, and how can they coordinate their services? · staff are responsive to the specific in-work support needs of clients with mental health problems. Clients of employability programmes are often not disclosing their mental health problems at the beginning of the programme. They may be reluctant to speak about their mental health problems in front of a group or with a staff member who they have just met. This poses challenges and is likely to effect if and how they engage with a programme and integrate with other participants. It can also be the reason behind unexplained absences. When mental health problems remain undisclosed, staff members are less able to adapt their service to respond to a particular client’s needs. It is important that staff are provided with sufficient time and have the necessary skills to understand each client’s individual barriers and to build trusting relationships with clients. The reason is that recovery is not a linear process; it has ups and down and changes in direction. Each turn plays an important role in someone’s recovery journey. The reality of moving back into work is far more complex than the linear progression that funders may expect, especially for people managing mental health problems (the conflation between distance travelled tools and needs assessment tools is covered in an upcoming blog by my colleague, Clare Hammond). Where mental health concerns are present, sensitive data collection and a nuanced interpretation of data is vital. We are currently working with a number of organisations to help them to describe their impact to funders and decision makers with the nuance required to convey the non-linear journey of recovery. Understanding mental health as a complex recovery journey also means recognising that the support needs of clients do not end when they move into work. Being in a new job – a new environment with new colleagues, tasks and challenges – can put people under immense pressure. As such, clients with mental health problems, particularly those with anxiety, often require ongoing mental health support and confidence building in the early stages of employment. If an increasing proportion of employability clients experience mental health problems, and if mental health problems can affect the kind of support that clients need at different stages, how are employability providers adapting to these challenges? This will be the focus of the next blog post in this series. 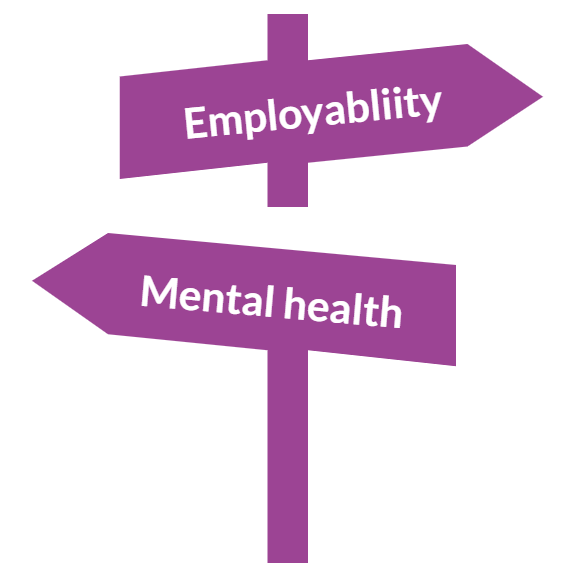 This blog is part of a wider series of upcoming blogs on the intersection between employability and mental health.